VENEZUELA: President Survives Assassination Attempt, Blames Colombia And US Expats In Florida [VIDEO] - Joe.My.God. 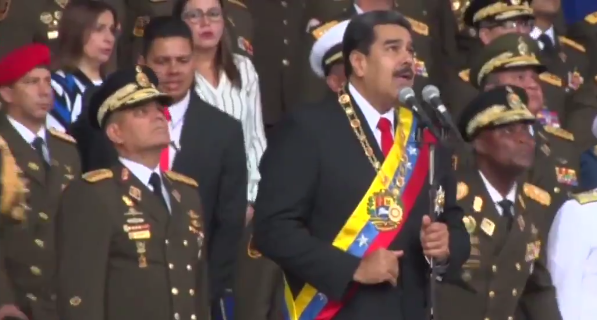 Venezuela’s president, Nicolás Maduro, has survived an apparent assassination attempt after what officials described as drones armed with explosives detonated overhead during a speech he was making at a military event. The drones, according to officials, were flown towards Maduro as he addressed soldiers in Caracas on Saturday. Mid-speech, Maduro and his wife, Cilia Flores, looked up at the sky and winced after hearing the sound of an explosion. The drones did not reach him, officials said, but it was not clear if they were shot down or exploded prematurely. Seven people were injured, the country’s information minister said. “This was an assassination attempt, they tried to assassinate me,” Maduro said in a later televised address. A little-known group called the “National Movement of Soldiers in T-shirts” claimed responsibility for the attack. In a series of posts on social media, the group said it had planned to fly two drones but that snipers shot them down. “We demonstrated that they are vulnerable. We didn’t have success today, but it’s just a question of time,” said the group, which says it was founded in 2014 to bring together all of Venezuela’s “groups of resistance.” Maduro won a new six-year term in May but his main rivals disavowed the election and alleged massive irregularities. He also blamed Venezuelans living in the US. “The preliminary investigation indicates that many of those responsible for the attack, the financiers and planners, live in the United States in the state of Florida,” Maduro said.